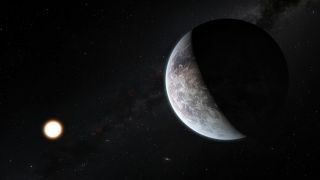 This artist’s impression shows the planet HD 85512b orbiting the Sun-like star HD 85512 about 35 light-years from Earth. This planet is about 3.6 times as massive as the Earth is at the edge of the habitable zone around the star, where liquid water, and perhaps even life, could potentially exist. We know for certain that life exists in the Milky Way galaxy: that life is us. Scientists are continually looking to understand more about how life on our planet came to be and the conditions that must be met for its survival, and whether those conditions can be replicated elsewhere in the universe. It turns out that looking at our entire galaxy, rather than focusing just on life-giving properties of our planet or indeed the habitability of regions of our own solar system, is a good place to start. Copernican theory tells us that our world is a typical rocky planet in a typical planetary system. This concept has spurred some astronomers to start thinking bigger, way beyond the simplicity of any one planetary system and instead towards much grander scales. Astronomers are exploring whether there is a Galactic Habitable Zone (GHZ) in our Galaxy – a region of the Milky Way that is conducive to forming planetary systems with habitable worlds. The Galactic Habitable Zone implies that if there are conditions just right for a planet around a star, then the same must go for a galaxy. This concept was first introduced by geologist and paleontologist Peter Ward and Donald Brownlee, an astronomer and astrobiologist, in their book, 'Rare Earth.' The idea of a GHZ served as an antagonistic view point to the Copernican principle. Despite scientists such as Carl Sagan and Frank Drake favoring the theory of mediocrity based on the Copernican model, which supports the probability of the universe hosting other forms of complex life, Ward and Brownlee were certain our Earth and the conditions within our galaxy that allowed such life to evolve are both extremely rare. Their answer to the famous Fermi paradox – if extraterrestrial aliens are common, why is their existence not obvious? – is that alien life more complex than microbes is not very common at all, requiring a number of factors, each of low possibility, to come into play. In short, Ward and Brownlee were suggesting that much of the galaxy was inhospitable to complex life. In their view, only a narrow belt around the galaxy was fertile: the Galactic Habitable Zone. Since then, many astronomers have looked at the idea of the GHZ. Not all believe that it necessarily supports Ward and Brownlee's Rare Earth hypothesis. A multi-wavelength image of the Milky Way's center. It is towards the galactic center where the highest number of stars and rocky planets reside, but also where the most supernovae occur. Their paper, accepted for publication in the journal Astrobiology, modeled habitability in the Milky Way based on three factors: supernova rates, metallicity (the abundance of heavy elements, used as a proxy for planet formation) and the time taken for complex life to evolve. They found that although the greater density of stars in the inner galaxy (out to a distance of 8,100 light-years from the galactic center) meant that more supernovas exploded, with more planets becoming sterilized by the radiation from these exploding stars, the chances of finding a habitable planet there was 10 times more likely than in the outer galaxy. This contradicts previous studies that, for example, suggested the GHZ to be a belt around the galaxy between distances of 22,800 light-years and 29,300 light-years from the galactic center. What's noticeable is that our sun orbits the galaxy at a distance of about 26,000 light-years – far outside GHZ proposed by Gowanlock's team. "We assume that metallicity scales with planet formation," Gowanlock said. Heavy elements are produced by dying stars, and the more generations of stars there have been, the greater the production of these elements (or ‘metals’ as they are termed by astronomers). Historically, the greatest amount of star formation has occurred in the inner region of the Milky Way. "The inner galaxy is the most metal-rich, and the outer galaxy is the most metal-poor. Therefore the number of planets is highest in the inner galaxy, as the metallicity and stellar density is the highest in this region," Gowanlock said. However, amongst so much star formation lurks a danger: supernovae. Gowanlock’s team modeled the effects of the two most common forms of supernovae – the accreting white dwarfs that produce type Ia supernovas, and the collapsing massive stars of type II supernovae. Measurements of the galactic abundance of the isotope aluminum-26, which is a common by-product of type II supernovas, have allowed astronomers to ascertain that a supernova explodes on average once every 50 years. Meanwhile, previous studies have indicated that a supernova can have a deleterious effect on any habitable planet within 30 light- years. A supernova sterilizes an alien world in this artist's impression. The team discovered that at some time in their lives, the majority of stars in our galaxy will be bathed in the radiation from a nearby supernova, whereas around 30 percent of stars remain untouched or unsterilized. "Sterilization occurs on a planet that is roughly [at a distance] between 6.5 to 98 light-years, depending on the supernovae," Gowanlock said. "In our model, the sterilization distances are not equal, as some supernovae are more lethal than others." Although the outer regions of the galaxy, with their lower density of stars and fewer supernovas, are generally safer, the higher metallicity in the inner galaxy means that the chances of finding an unsterilized, habitable world are ten times greater, according to Gowanlock's model. However, their model does not stipulate any region of the galaxy to be uninhabitable, only that it’s less likely to find habitable planets elsewhere. However, not all are in favor of the new model. Ward and Brownlee noted that the sun's position in the galaxy is far more favorable because planets that dance around stars that are too close to the galactic center are more likely to suffer from a perturbed orbit by the gravity of another star that has wandered too close. Others question some of the assumptions made in the research, such as the accuracy of the percentage of planets that are habitable in the galaxy (1.2 percent), or that tidally-locked worlds can be habitable. “The authors may be making some assumptions that aren’t too well justified,” said Jim Kasting of Penn State University and author of "How to Find a Habitable Planet." "They seem well ahead of the rest of us who are still pondering these questions." However, others believe that the research is promising. "This is one of the most complete studies of the Galactic Habitable Zone to date," said Lewis Dartnell, an astrobiologist at University College London. "The results are intriguing, finding that white dwarf supernovae are over five times more lethal to complex life on habitable worlds than core collapse supernovae." The GHZ isn't static; the research paper written by Gowanlock's team points out that over time the metallicity of the galaxy will begin to increase the farther out one travels from the galactic center. "This is why stars that form at a later date have a greater chance of having terrestrial planets," Gowanlock said. As a result, perhaps the heyday for life in our galaxy is yet to come.